6.4 Did you make this recipe? There isn’t a Christmas that goes by that I don’t remember that wonderful time in my college life when friends of mine would let me hitch a ride with their family to take me home to the city for the Holidays. They’ve often lived in proximity to the city, such as Connecticut, Long Island or New Jersey, but not in the city proper. Even then, I knew it was quite the gesture, as navigating the city with a car during the season was no easy task. I was always so grateful. After the first couple of years, we all smartened up, and in lieu of the trip all the way home, I was usually invited by the friend’s family (who was fortunate enough to have me tag along in the car) to stay with them for a night or two, before sticking me on a train to make it home for Christmas Dinner. I preferred this jaunt over the previous. I always lived in tight quarters in the city and my family, though not poor, certainly were not rich. So to stay at a house with large space, and usually, my own room in which to sleep, even for just a day or two, was always such a treat. One of my favorite stops, for more reasons than just the hospitality, was at one of my college girlfriend’s house in a town in Connecticut. Where she lived was the perfect spot, as it was halfway from school and home. She had a grandmother that lived not too far from them that would come over and cook for the family every so often. They affectionately called her “Grammy”, and she liked to be referred to as such, even by me. (who is also of Polish ancestry) but never able to replicate Grammy’s dish. That girlfriend has been an “ex” for many years now, but I still have fond memories of that family. During this time of the year, I always take time to think about all the beautiful people that have crossed my path. One of them being “Grammy”. 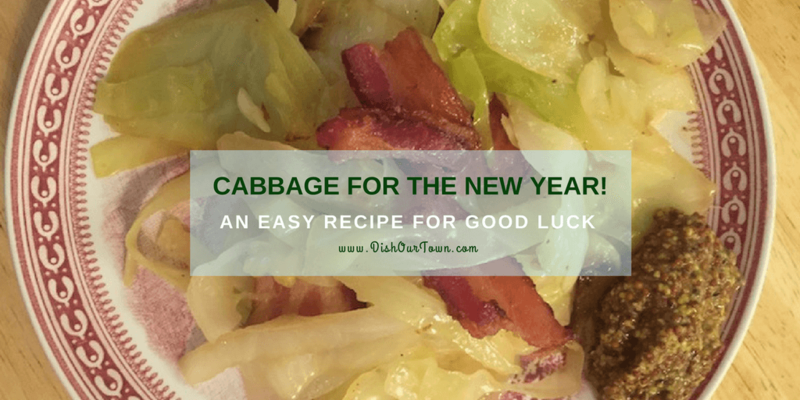 The perfect humble meal or side dish, cabbage for New Year’s Day to bring all some good luck. Over medium heat, add olive oil to a medium-sized pot. When the oil is hot enough, add half of the bacon and cook until crisp (5-7 minutes). Stir until cabbage for 5-10 minutes depending on how crisp you want the cabbage. This is a quick and easy recipe. 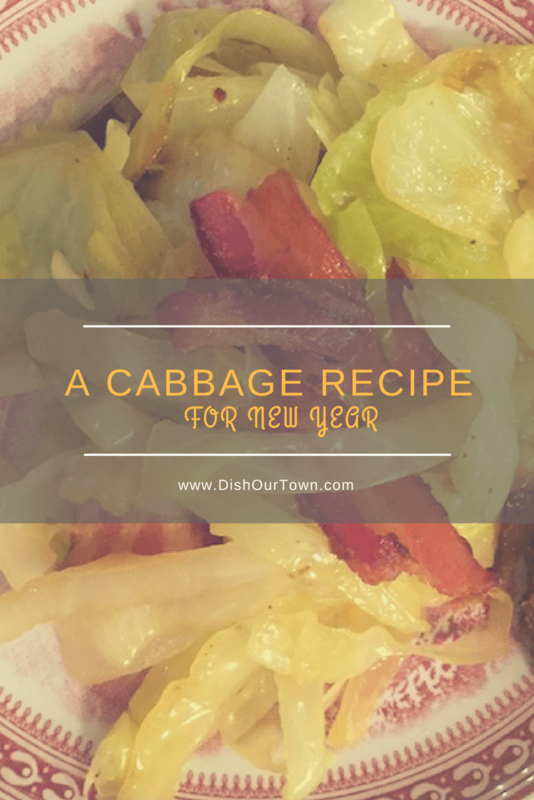 Cabbage on New Year’s Day or Eve makes for a great side dish, or a humble meal. Pairs very well with all white sparkling wines ranging from Cava to Champagne. We prefer Prosecco in our household, especially when not so dry, it is perfect with New Year’s cabbage. This part of the East Village was once the enclave for Ukrainian and Polish cuisine. The offerings aren’t as prominent as they once were, but there are old standards such as, http://www.littlepolandnyc.com/ which still exist and dole out some very authentic dishes. You’ll find some sort of cabbage here any day of the week. Pin it to your favorite recipe board! This was easy and delicious! Thank you. Thank you so much for trying it out, glad you liked it. I’m making this today. It looks yummy. I’m confused about the bacon, though. It says to cook half the bacon, then later it says sprinkle the remaining bacon on top… I’m assuming you didn’t mean to sprinkle on raw bacon..?? Thank you for making this. Sorry for the confusion and will edit this to make it clearer. 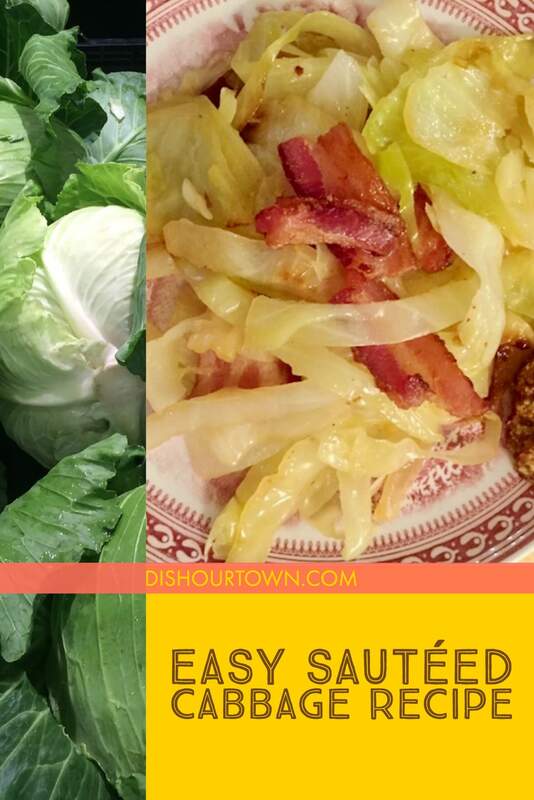 Yes, all bacon is cooked but just use half to add to cabbage while sauteing and then use to the rest to sprinkle on top for crunch.